I hope everybody had a fabulous New Year! The husband and I met up with some friends for dinner and a few drinks. A pretty low key evening but just the way I like it. Like many people I have been reflecting on the past year and making plans for the one ahead. A few weeks ago I went to a seminar called Making Your Mind Magnificent. The speaker Steven Campbell suggested against resolutions and instead suggested that we give ourselves affirmations each day. Affirmations can be a tricky thing because when people hear about affirmations the connotation is not always positive. Mr. Campbell's approach was different than what I have heard in the past so this year I will be working on affirmations instead of resolutions, but as he suggested I will be keeping most of them to myself. One of the things I am going to try this year is to take new strides in my creativity and my art. In order to be successful I needed to start with some cleaning. What better way to start the new year than with a clean workspace. I am very fortunate to have an entire craft room to myself. Last year I had a small jewelry show and I never really "cleaned up" from it. I have literally been opening the door for the past year and just throwing things in. Part of the issue is that I discovered Zentangle and who would rather clean than Zentangle! 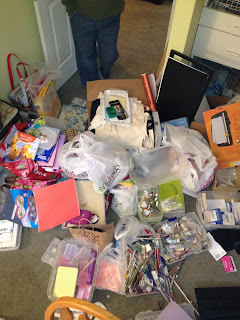 Surely not me, so the cleaning and organizing of the craft room got put on the back burner. This week my crafting buddy Sudahlia and I decided it was time to make a fresh start and I have to say, the results were pretty awesome! and a few wood dowels. Voila! I only used official Zentangle tangles. I only used tangles that I had never tried before. I had my ambulance partner Jenn (she has a great new blog called Girl Defying Gravity), pick all the tangles for me sight unseen just to make it a little more challenging. I think this challenge probably deserves a revisit. Next time I'm going to attempt it using all non-official tangle patterns. Thanks for the challenge Sue! Congrats on getting your art space cleaned up so nicely! I'm sure you'll be creating all kinds of art in the new year. Love your alphabet soup! Do you want to come help me clean up my studio next? These are great! and congrats on your yummy studio. Those are some great tangles - I thought it a really fun challenge and will certainly work through it again. The transformation in your workroom is certainly amazing! You must feel like going in there all the time...just to stand and look! These are gorgeous tiles! That took some time and research. Love the outcome. Good work on the studio!